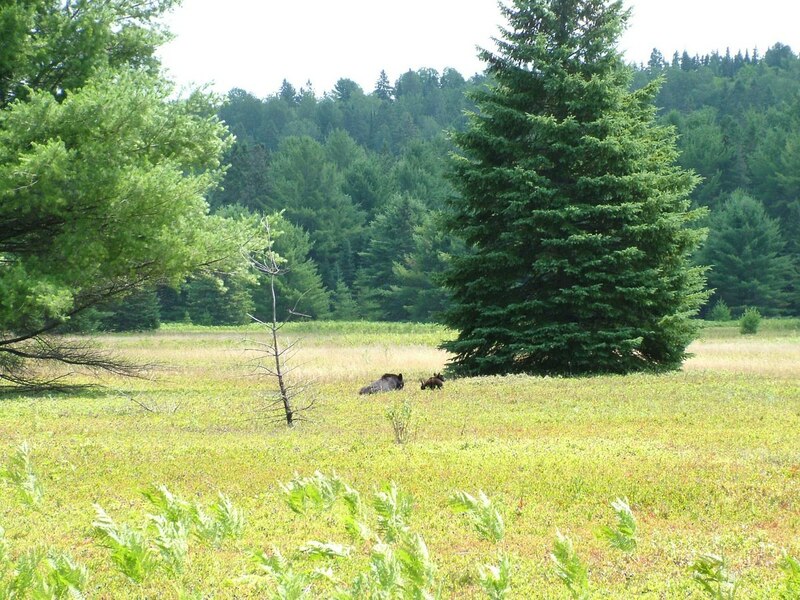 This past summer, Bob and I once again found ourselves in Algonquin Provincial Park here in central Ontario. 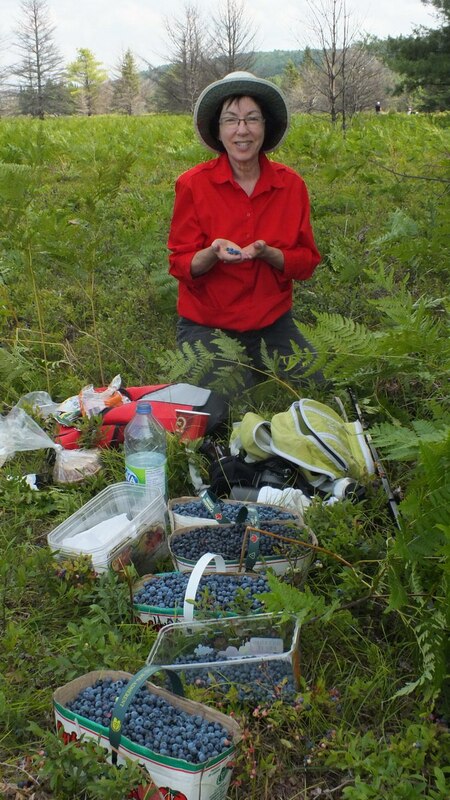 We had various objectives during our two-day visit to the area, and one of them was to pick wild blueberries. Having heard that the crop was more plentiful than usual, we were eager to put ourselves to the task of harvesting a few. 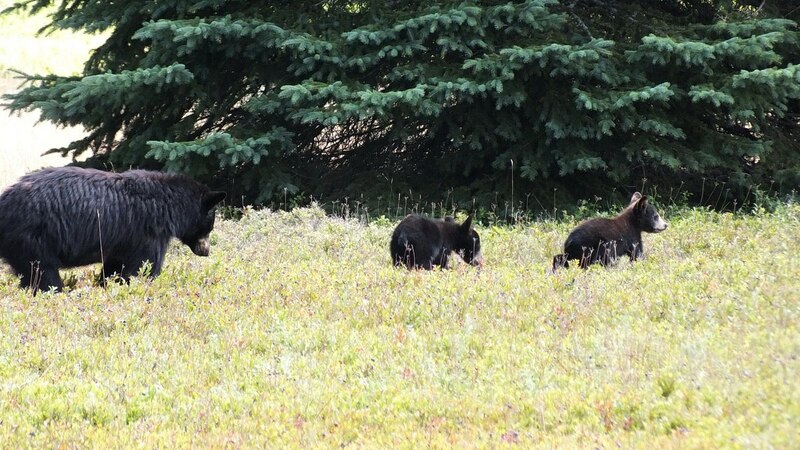 It was quite a surprise to find that an American Black Bear (Ursus americanus) and two cubs were sharing the blueberry patch with us. The plump blueberries were at the peak of ripeness and hung liberally from low bushes that blanketed the ground into the distance effectively transforming the field into a sea of blue. It was impossible to walk without feeling guilty about the thousands of berries being squashed beneath our feet. A sign had warned visitors that bears were in the area so, as we picked over the course of the morning, Bob and I lifted our heads occasionally for a glance around the sprawling meadow to see if maybe the bears had decided to make an appearance. We were really hoping for a chance to see them. As lunchtime approached, Bob ventured back to the car to fetch our picnic, and the next thing I knew, he was returning on the run. I immediately knew something was afoot. I had been so intent on the task at hand that I was totally oblivious to the 25 or 30 people who had gathered a short distance away from “my patch of blueberries”. Even when I stood up to see what Bob’s hurry was, I neglected to look around being more focused on what he was saying. “Grab your camera!”, he shouted. “The bear is right behind you.” That is when I glanced to my right where keen photographers and interested campers had amassed, all with their cameras and cell phones trained on one spot about 30 metres (100 feet) behind me. When I looked in that general direction, the first thing that caught my eye was some movement beneath a large spruce tree. I recognized the little black body dangling from a bare branch as a bear cub, and I had to chuckle because I thought it looked more like a chimpanzee than a black bear silhouetted there with the blazing sun at its back. The Black Bear paid no heed to the assemblage of people and fed non-stop on the sweet berries. Everyone was respectful of the animals knowing full well that, should someone get too close and cause the sow to feel that her cubs were in danger, she would become downright fearsome and aggressive. 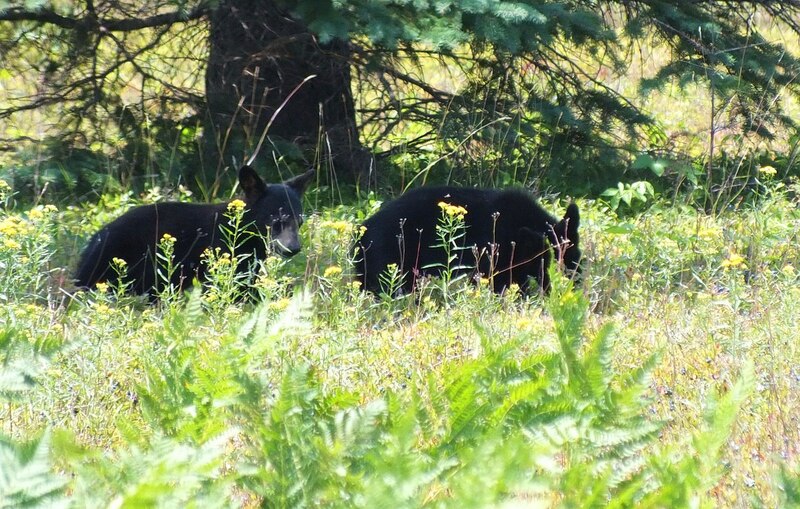 On speaking to Park’s employees later in the afternoon, we learned that, in fact, two days earlier, a major battle had ensued between this mother Black Bear and a male Black Bear that was encroaching on her territory. 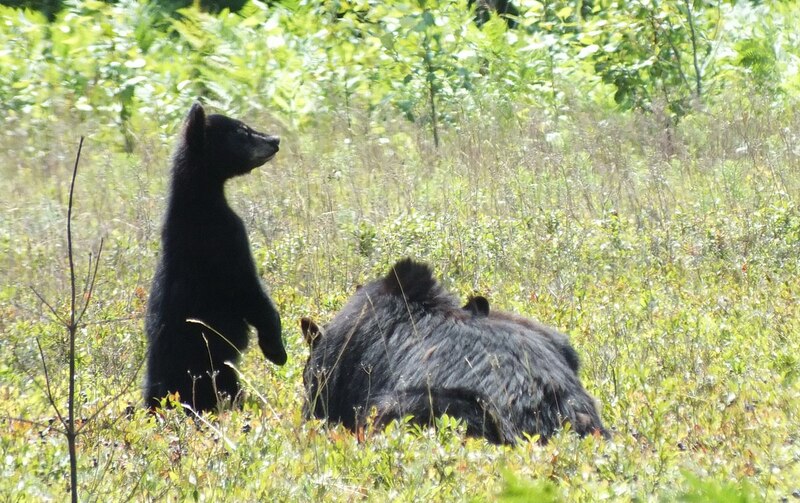 A male Black Bear will actually eat cubs, so the sow had assumed her role as protector, successfully stood her ground and battled to protect her babies. It was not without suffering an injury, however. As the sow lumbered from one spot to another, Bob noticed that she was favouring her front right paw. Her movements highlighted a significant limp, and she often laid down in the crunchy growth underlying the blueberry bushes to take the pressure off of her foot. 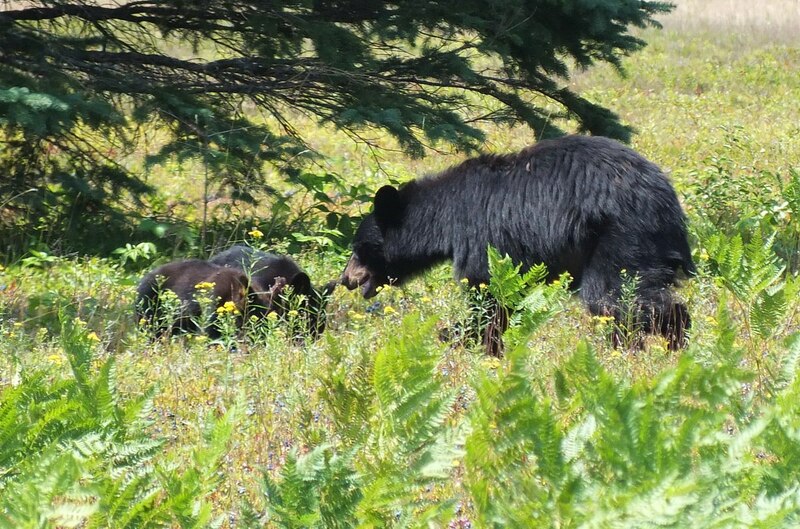 After considerable time passed, one of the bear cubs was brave enough or sufficiently hungry to join its mother out in the sunshine where the blueberries were more plentiful. Black Bear cubs are hairless, toothless and sightless at birth and no larger than a chipmunk. By the looks of this cub, it was well nourished on the sow’s rich milk since being born in January, but now, the bears feast continuously on wild berries to pack on the pounds in preparation for hibernation. Fat makes up about 40 percent of a bear’s weight at the start of the winter. After hibernating for several months, a bear’s fat reserves will be almost totally absorbed into the body as a way of sustaining the animal until spring. 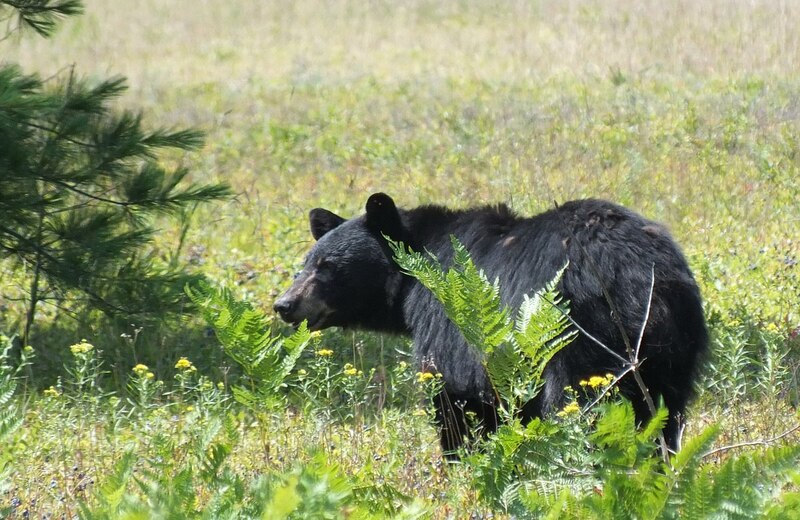 In fact, a bear will have lost about 30 percent of its weight by the time it emerges from its den and continues to do so until the mid-summer fruit crops become available. Lactating females nurse their cubs for a full year and therefore may lose weight that whole time because milk production demands a lot of energy. 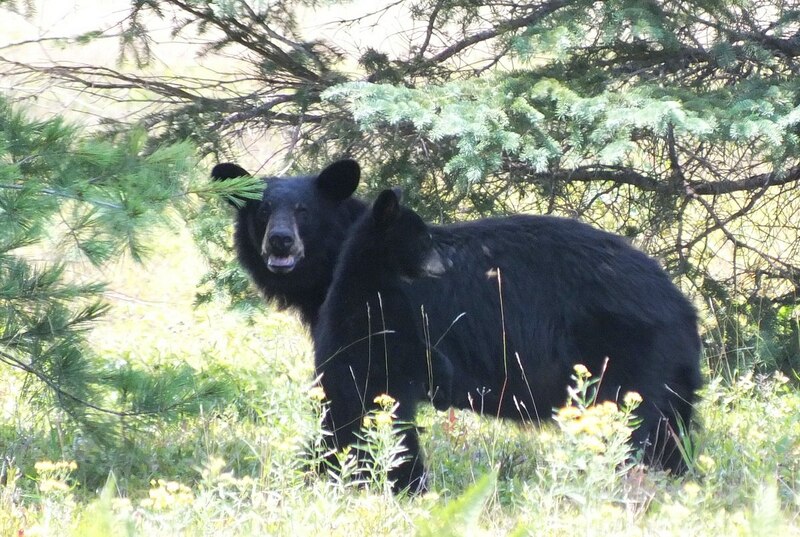 It wasn’t long before the second bear cub ambled out from beneath the spruce tree to partake in the bountiful buffet. There was no time for horseplay. The babies simply kept their noses to the ground and scooped mouthfuls of berries by using their prehensile lips to delicately pluck the berries from each bush. The wooden stems and soft leaves of the plants posed no problem because the bears’ flexible lips can bend and grasp to pick each berry one by one. Their long manipulative tongue is also a huge benefit when consuming tiny blueberries or miniscule ants. With the cubs a short distance away, the mother bear became restless and soon shuffled over to check on their well-being. Bears must double their weight before the onset of winter so their primary occupation from April through to November is the consumption of food. The cubs needed little instruction in foraging for blueberries, but later in the season, when beech trees are loaded with nuts and oak trees heavy with acorns, they will follow the mother’s example and gorge on those high-fat seeds even, on occasion, while sitting aloft in the crotch of a tree. Other sources of food are not so easy to come by. The sow will show her babies how to overturn logs and stones in search of grubs, tear apart rotten stumps so they can lap up swarms of ants, or dig holes in search of beetle larvae, all of which are high in protein. Each of a bear’s feet has five long, powerful non-retractable claws that are used for this purpose as well as climbing. It became apparent to Bob and me that deporting ourselves in hushed tones was not necessary. 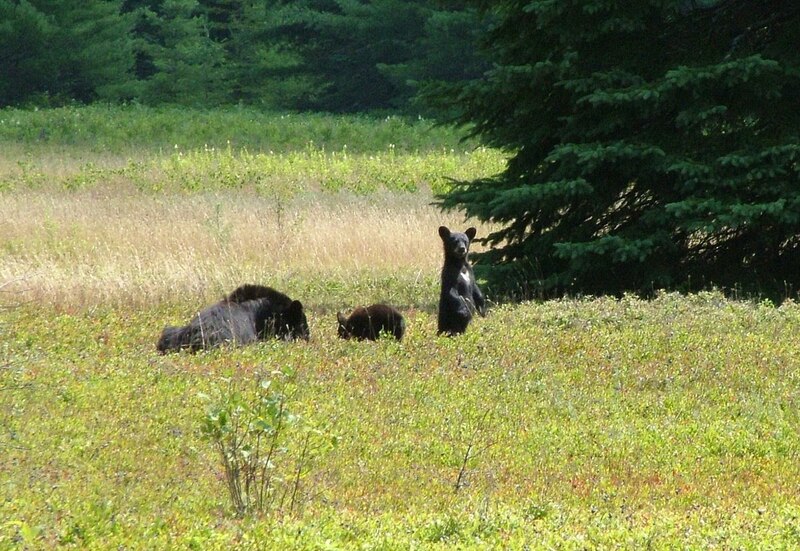 In fact, it was possible to circle the general area in order to view the bears from different angles. The cubs were intrigued by our movements and frequently stood up for a better view of we humans. The sow was not so easily amused. Even though a bear emerges from hibernation somewhat emaciated, its coat is thick and luxuriant having grown all winter long. Not only was this sow hurting, she must have been uncomfortably hot there fully exposed to the sun. It was about 30 Celsius (86 F). 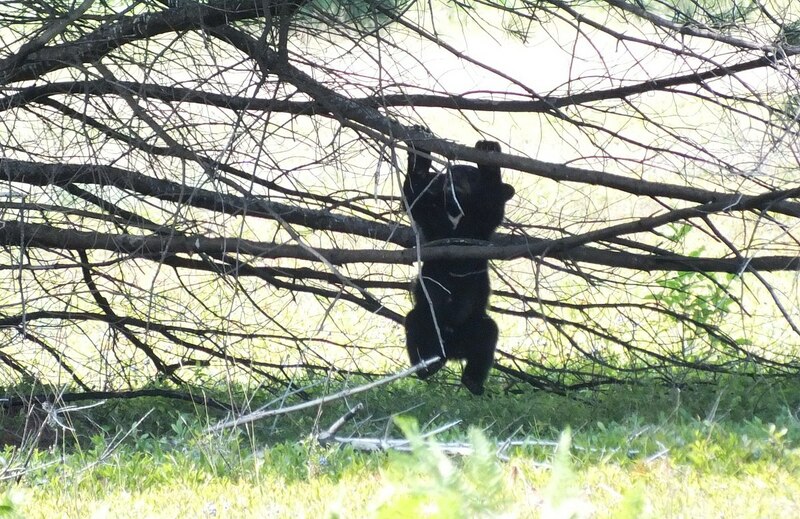 For one little bear cub, it was time to retreat to the cool shade of the nearby evergreen tree. Between the two of them, they seemed to delight in clambering up the tree trunk and lowering themselves from the branches. One of the first skills passed on to the cubs from the mother is how to claw their way to safety by scaling a tree and remaining out of harm’s way. They have learned their lesson well judging by the number of times they bounded up the trunk just while we were watching their antics. 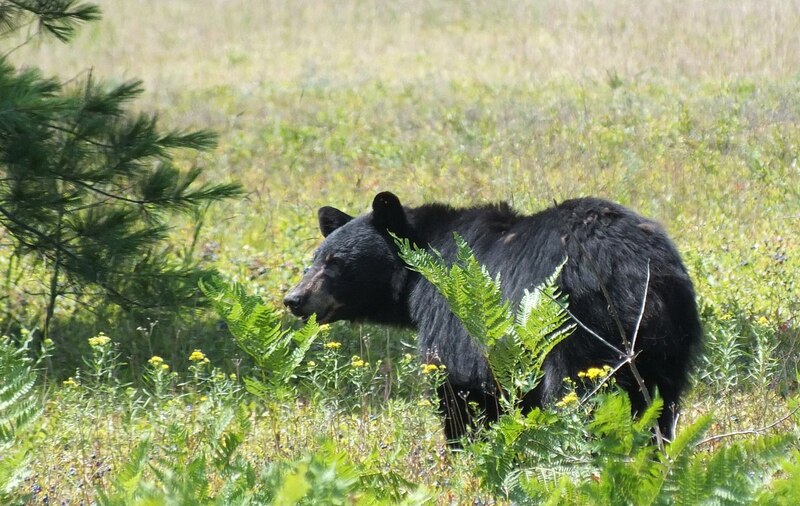 Black Bears will feed for hours at a time when there is a good supply of fruit available. While we looked on, a good hour passed and still the bruins gave no indication of leaving the old airport landing strip that has become overgrown with blueberry bushes. The cubs routinely stood up for a gander when excited children squealed with delight, and that is when we noticed that the one little cub has a white blaze on its chest. About 80 percent of all cubs born will have such a whitish “V” chest patch, but it will fade away on most of them as the cubs age. With the little cub standing tall, its small rounded ears were perked to capture each and every sound drifting through the air. Bob and I were so pleased for the bountiful crop of blueberries because there were more than enough to satisfy the few pickers and to provide the much-needed nutrition for the three hungry bears. Without a good supply of summer fruits to build up the bears’ reserves, they might not be able to survive the winter. On top of that, the vital nourishment determines whether or not a sow will produce young the following spring. 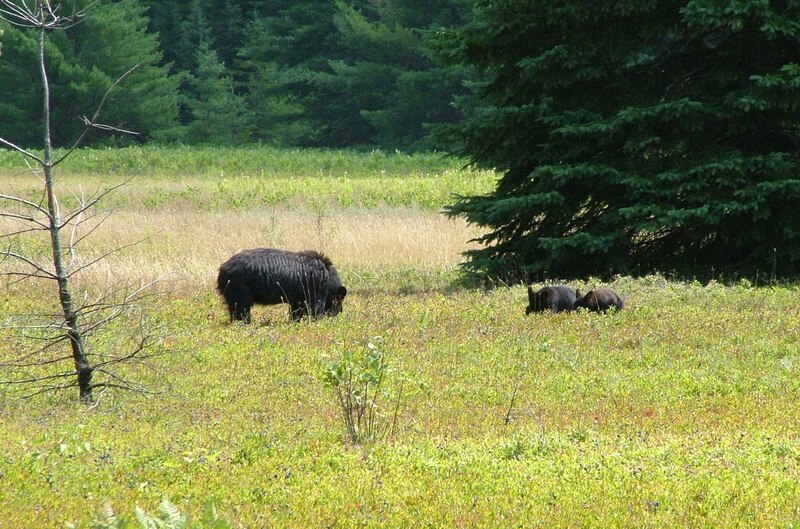 As we learned from the Park’s employees, there is actually another family of bears occupying another corner of the same blueberry patch, a sow with one cub. 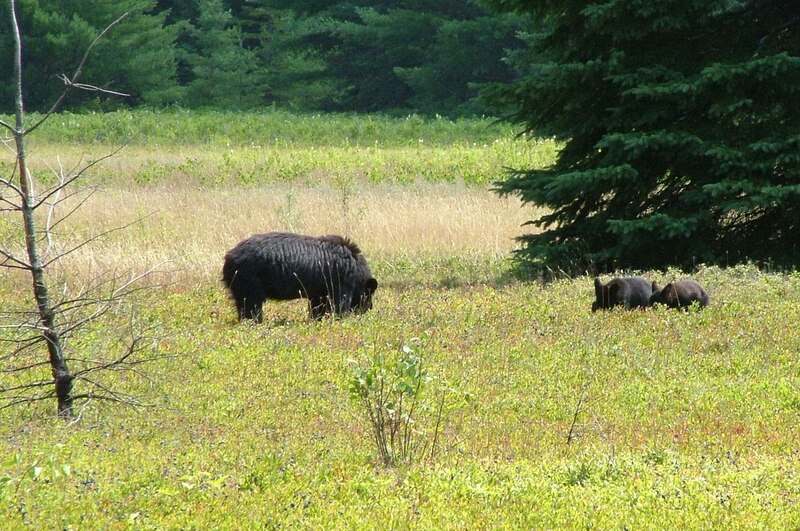 When the sow and two cubs finally had their fill, they wasted no time seeking shelter and shade. With amazing speed, they hastened towards the thick ferns and fringe of evergreen trees at the edge of the meadow. They may appear awkward as they shuffle along, probably because they walk flat-footed, but they are capable of speeds up to 55 kilometres per hour (34 mph). 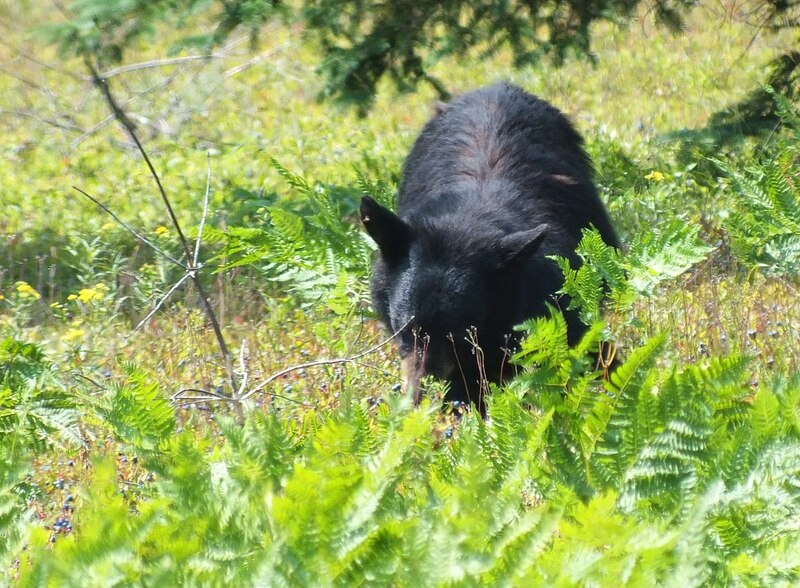 It is a good thing that Black Bears are shy, solitary animals that go out of their way to avoid human contact. In wilderness areas such as in Algonquin Provincial Park, they are most active from dawn until dusk. They are not normally aggressive towards people, and if human presence becomes too much of a disturbance to their routine, they are apt to resort to prowling at night to avoid human contact. Bob and I were so happy that the bears did not feel threatened by the keen observers. It made our day to see these handsome animals in their natural habitat. 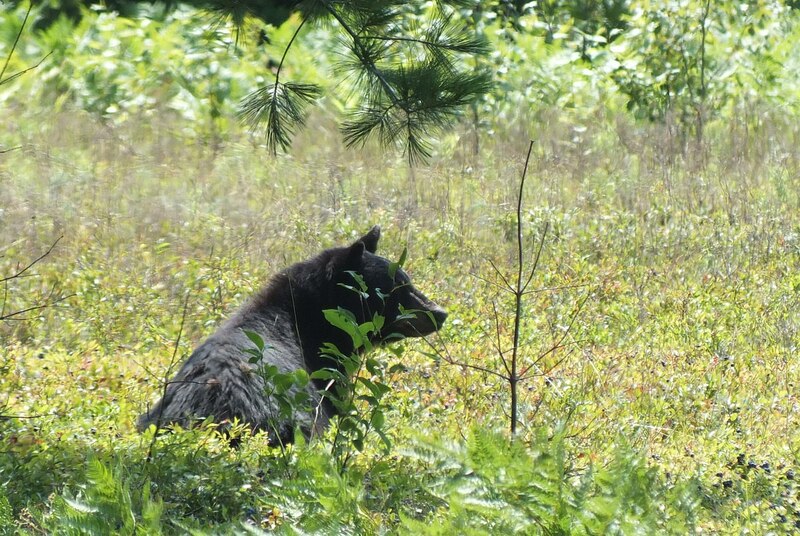 As an added note, the Park’s staff were grateful that we took the time to report the sow’s injured foot because they had been unable to determine which female bear had been injured in the fight with the male bear. 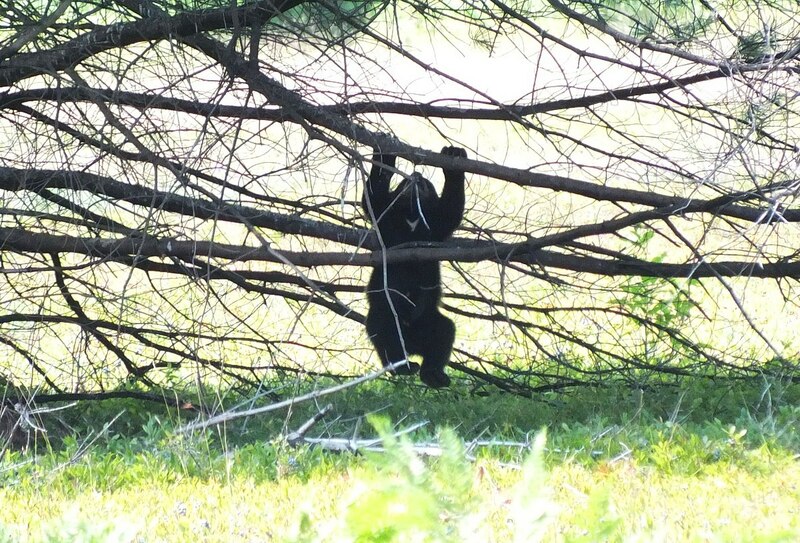 They planned to notify the Park’s veterinarian so that prompt action could be taken to treat the bear’s sore paw. My husband and I are looking forward to going to Algonquin Park again for the fifth year in a row. Now last year we were looking for other animals as well and Walla we seen a Moose and her baby. 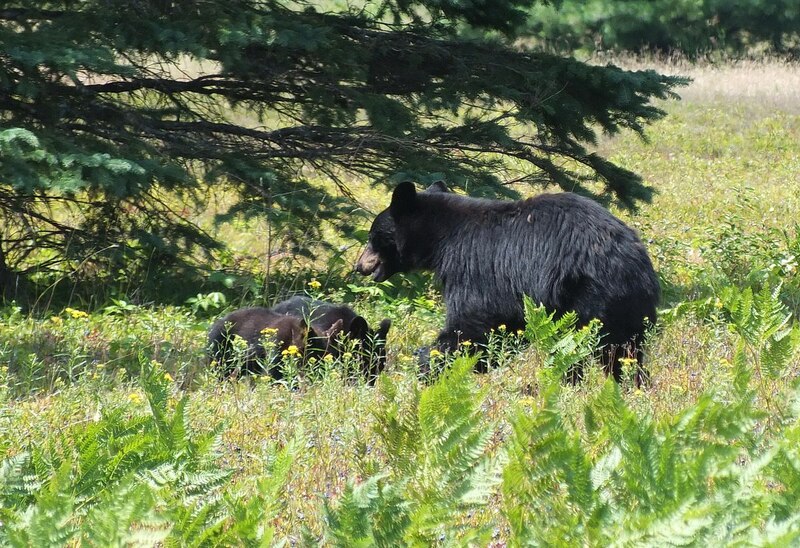 The year 2015 and 2016 were bad for the Black bears due to the ice storm up that way in 2015 and the early frost they had in mid April of last year…Therefore the blueberry patch suffered…We did not get to see them…..:( We are hoping to see them again this year as we enjoy this park…I also want to thank Bob & Jean for your story it was a delightful to read and I very much enjoyed reading….Thank you….. Thanks so much for your kind comments, Cathy. Algonquin Park is definitely a place worth visiting over and over again. We go there every opportunity that we get because each time brings a different experience. And I love the anticipation when looking for animals because they can pop up just about anywhere. Hi Sydney. When I was a child, my dad used to take me and my sister to pick raspberries in Algonquin Park, but I have no idea where we used to pick those fruits. 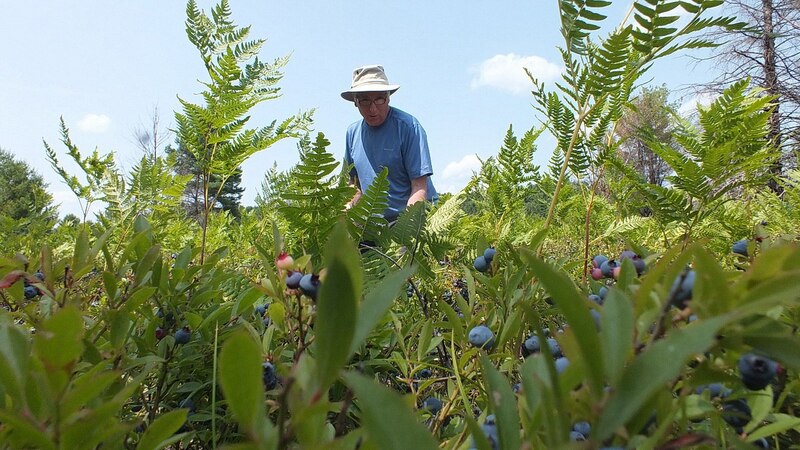 Most people familiar with the Park know where to find blueberries, and they are not restricted to any place in particular. Sadly, the crop of blueberries is weather dependent, and for two years in a row, a late frost has frozen the blossoms resulting in very few berries. Unfortunately, the bears are struggling to find enough food to eat this summer as they did last season, too. Thank you for your interest in our blog. I would love to thank you for posting this but you are giving away Canadian secrets. We get all the kids out there and I think they eat more then they put in the baskets. So glad that you get the children involved. It makes for such a pleasant outing while camping in the Park or even for a day trip. Gotta love Algonquin. Thank you for your comment. Thanks for checking out our blog. I have sent you an email. I am glad that there were still berries available to be picked. I know they were getting pretty ripe as of last week because my parents went for more. 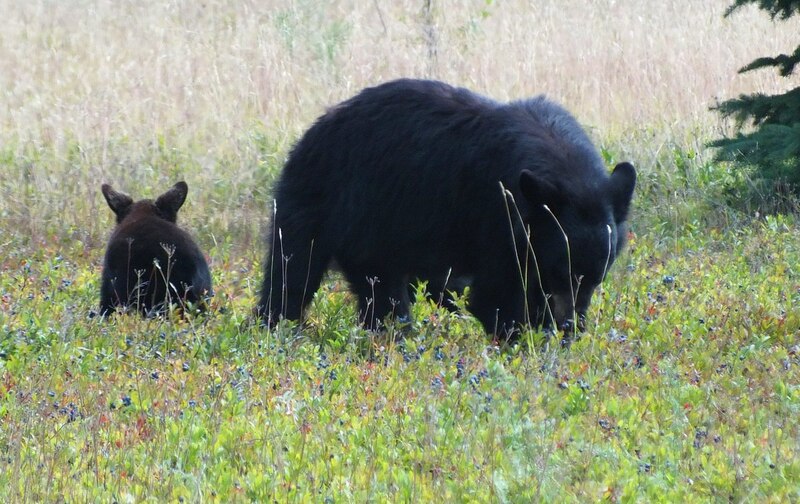 They saw the bears on their previous visit to the patch, but not the last time. Thanks for reading our blog post.